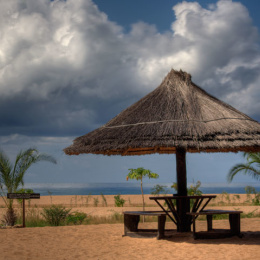 On the Northern shores of Lake Malawi lies Chitimba Camp. Chitimba is a village situated 122 km south of the Malawi/Tanzania border at Karonga, and 143 km from the capital of the north, Mzuzu. The lodge/campsite is set on a beautiful golden sandy beach, amongst banana palms and papaya trees, surrounded by the famous Livingstonia and Nyika mountains. It lies off a tarmac road that runs straight through the country, from the border of Tanzania all the way to the capital city of Lilongwe. The lodge/campsite is mostly visited by overland trucks, backpackers and by independent travelers with own transport. During the day it is possible for people to visit Chitimba camp to have a drink or eat something. Chitimba Camp is the first (heading south) or last (heading North) stop in Malawi for overlanders. The camp features a restaurant that serves breakfast and lunch, and dinner can be booked should guests require. There is also a great bar where guests can relax with a cold beer or soda, and Wi-Fi is available at an additional charge. The camp has a craft shop where locally made crafts are sold and laundry can be washed by the local women of Chitimba Village. A walk around Chitimba Village can be arranged and guests can visit the schools, the orphanage and see where the local people live. Hikes in the surrounding mountains can also be arranged and offer scenic views.